Food quality and safety are two of the most challenging issues in the current regulatory environment that are of great concern to today's health-conscious consumers. 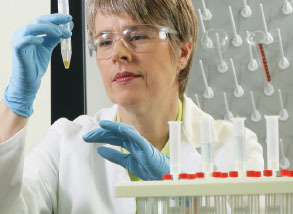 Whether you are testing for contaminants or developing a new production process, we're here to help. We help you maintain your focus where it should be—on delivering food products that meet the highest standards of food quality, safety, and authenticity that today's demanding consumers worldwide expect. Our solutions make it easy to ensure food integrity & safety—quickly, reliably, and repeatedly. Know your foods are all they should be and depend on the best: Thermo Fisher Scientific. Modern lifestyles and consumer demand for convenience foods mean that food manufacturers face increasing complexity when it comes to ensuring the safety of their products. Confidence that the foods they supply on an industrial scale and from multiple sources are safe from pathogen contamination is vital. The implications of getting it wrong can have serious consequences, with high profile outbreaks of food poisoning from contaminated products causing numerous illnesses, hospitalizations and, in some cases, deaths. A hazard- and risk-based preventative approach to microbiological food safety can significantly reduce the likelihood of pathogen contamination, and testing throughout the farm and production processes can verify the effectiveness of such control measures. We are here to support you with a complete solution for each step of your microbiological food testing workflow: from market-leading molecular instrumentation, sample preparation capability and real-time PCR technology for foodborne pathogen and quality indicator detection, to traditional culture media and biochemical or immunological tests. Our products include custom services that enable you to screen, monitor and even trace routes of contamination to the source. Learn how we can help you remain adaptive, responsive and competitive. In today's global economy, a food product or its ingredients may be sourced from a single farm or from producers and manufacturers worldwide. Truth-in-labeling regulations exist to verify the authenticity and origins of these products as they are exported around the globe. However, recurring food contamination scandals show that there is always room for error, if not intentional adulteration or counterfeiting. Ensuring food integrity means guarding against adulteration (the deliberate addition of false ingredients) and food fraud (false claims about what the product is), and ensuring its authenticity (that the product is from the claimed geographical region). Our scientists are constantly developing technologies for testing the authenticity of foods and feeds to protect consumer interests and public health. Detecting physical contaminants in food, such as metal, glass, stone, plastic and bone is like trying to find a needle in a haystack, especially when the contaminant may be as small as 1 mm in diameter. Whether it’s detecting foreign objects in cans, bottles, bags, boxes, or other types of packaging, food processors need to remove contaminants prior to further processing and being shipped out the door. Accurate and reliable metal detectors and X-ray detection systems provide the highest sensitivity so you can find virtually any metallic and non-metallic substance in your packaged food – and keep consumers safe. Food packaging and drinks packaging must also be manufactured in compliance with regulations, including good manufacturing practices, so that any potential transfer to foods does not raise food safety concerns, change the composition of the food or have adverse effects on the taste or odor of the product. Packing impurities include: a diverse range of chemicals from volatiles, high molecular weight non-volatile molecules, and even metals. Targeted and non-targeted packaging migration and food contact material testing is used to identify such compounds, using a wide range of chromatography-mass spectrometry techniques. Discover our testing solutions for leached chemicals and metals from packaging in food & beverage samples.